Our old friend Dr. Flea is facing some heat. He has written for us about another experience getting sued and "driving a yellow bus" in the Northeast. Now he gives us the lowdown on going to see his lawyer. 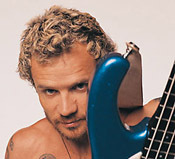 Thanks, Flea. I arrived at my attorney's office one hour early. This was not my intent. I left extra time because of fear of being late. There had been an horrific accident in downtown Boston yesterday morning and we were promised that traffic would be horrendous all day. I tried to kill time by walking around Government Center. I recalled a radio interview I once heard with Livingston Taylor, on the subject of stage-fright and performance-preparation. Taylor said he does two things before he performs on stage: First he arrives at the performance space early (okay, I had done that); Second, he thanks God for the privelege of being where he was, about to perform. I took Taylor's advice and gave thanks. When the deposition was over and I was back in my car, I called my office and spoke to my staff. I had not arranged for coverage during my deposition. The thought had simply never occurred to me that I may be away from the office for so long that I might be needed in the morning. The culprit was most likely denial. I didn't want to think about the deposition at all, so I didn't arrange for back-up. My nurse reported that there had been very few calls, and none that required my attention. I was enormously relieved. I thanked her and my secretary for being there to field calls in my absence. Then my nurse remarked "God was watching out for you today". I choked up and became afraid I would start crying on the phone to my nurse. I had forgotten about my prayer this morning. Now, I know Hashem has better things to do than listen to the prayers of a flea. But in case You really were listening, thanks.